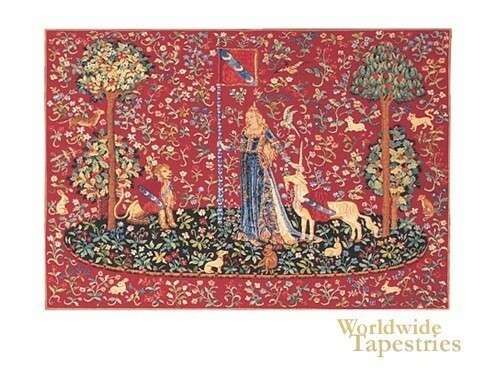 Commissioned by Jean Le Viste to commemorate his appointment to King Louis XI’s royal court, “La Dame a la Licorne” is a series of six tapestries. “Touch (Le Toucher) II” shows a lovely maiden, petting a unicorn. In her other hand is the banner of the Le Viste family, complete with the coat of arms which was three crescents against a blue stripe on a red background. Following Jean’s death, the tapestries were handed down from one family member to another, eventually ending up at the Musee National du Moyen Age in Paris, where they have been reunited in a specially built oval room. It is believed the tapestries were woven in Flanders in the 16th century and the use of the Mille Fleur style of design tends to support this. Touch (Le Toucher) II” is a wonderful work that will look great as medieval décor in your home. It is lined on the back and comes with a tunnel for easy hanging.